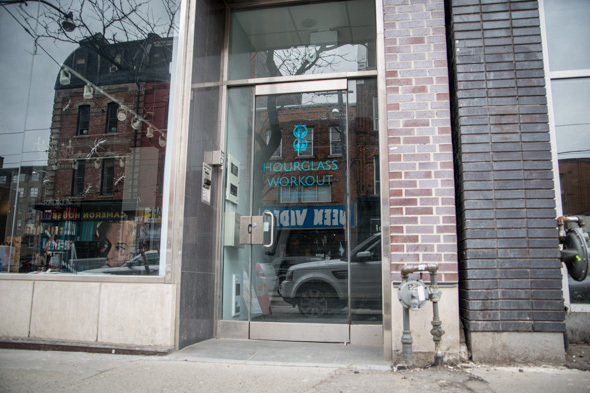 Hourglass Workout is a new fitness studio on Queen West, owned by fitness competitor and personal trainer Lyzabeth Lopez. Lopez has been featured on numerous television shows and was named the top fitness model in Canada by Inside Fitness Magazine, and although her amazing physique is a giveaway, you would never know of her fame from her warm, friendly, down-to-earth demeanor. 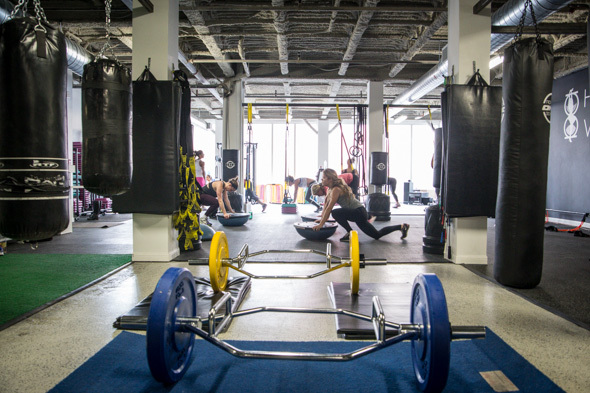 The studio is aimed primarily at women, and offers a range of small group training classes, as well as holistic nutrition counselling and networking opportunities. 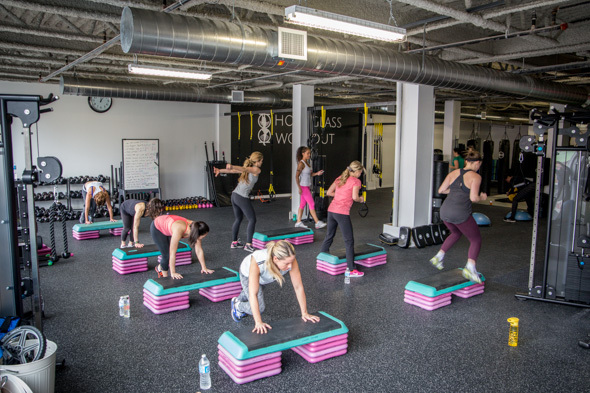 The classes are mostly boot camp/circuit style workouts that offer high-intensity training, using a variety of equipment such as steps, TRX suspension systems, BOSU balls and weights. 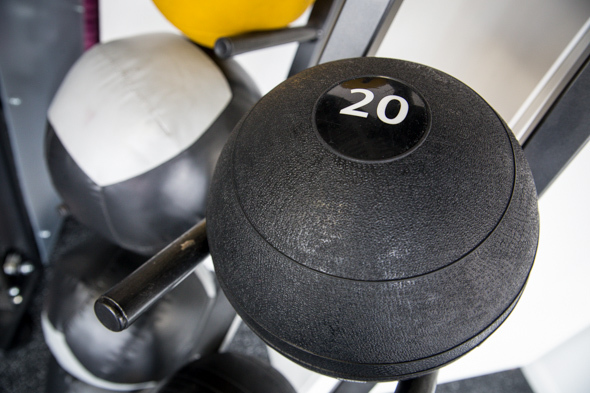 Classes are offered Monday through Friday, and each day the focus is on something different: plyometrics, lower body, upper body, core, etc. Hourglass is on the second floor of a building on Queen, just west of Spadina. 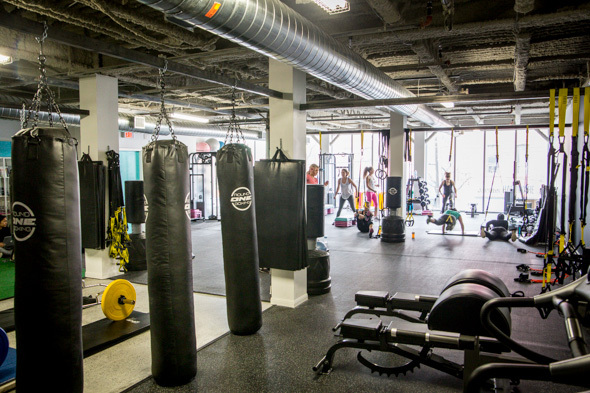 The gym is filled with equipment of various kinds and has change rooms for both men and women. The women's change room has one private bathroom, two private showers and some small lockers. A number of toiletries, such as hairspray, toothpaste, etc. are provided. My friend and I arrive for a lunchtime Plyo class and join about eight other women for this sweat session. 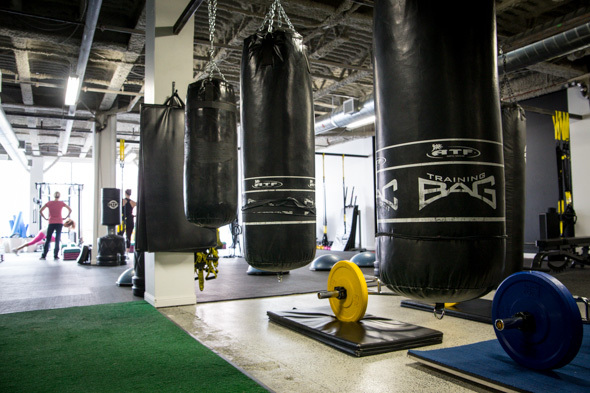 Don't arrive too early for the classes, we learned, or you'll be immediately put to work warming up with either skipping ropes or on the treadmills. The class is being taught by fitness pro Tyra Love, who looks every bit fitness model that she is. If Love trains herself like she trains her students, it's not hard to understand how she has achieved such amazing results. 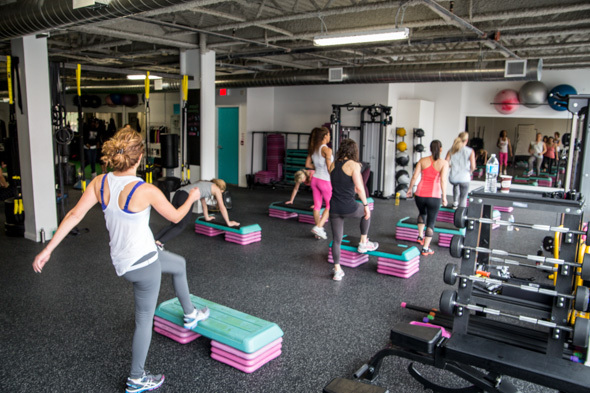 We are led through a series of stations involving jumps, mountain climbers, pushing ploughs (CrossFit style), squatting with weighted barbells, core work and power lunges with the TRX systems, and more. Somehow Love manages to keep a close eye on us at each of the stations, offering helpful tips and assistance when needed. Just when we thought we were done with the torture, she has us do far more core work than I thought I could ever do. There is no holding back here - the training is as challenging as it is fun. Most of us fail to complete each task without taking multiple rests or modifying to less intense versions. Love manages to squeeze a whole lot into the hourlong class, leaving us feeling both exhilarated and empowered. Both my friend and I were impressed by how comfortable we were made to feel as newbies to the studio and how much fun we managed to have in what was a pretty killer class. 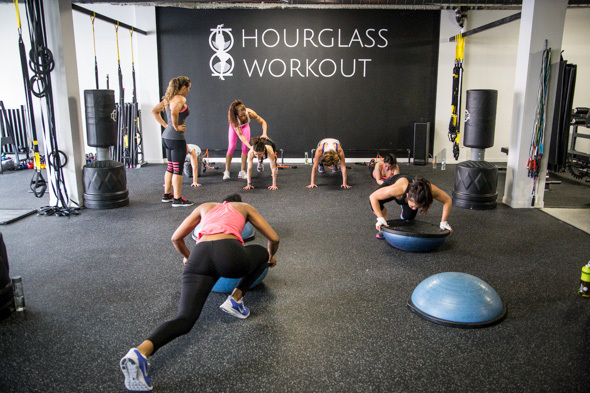 Although most classes are women-only, Hourglass does offer some co-ed training sessions throughout the week - if there are any guys out there who think they are up for the task. Classes can be purchased as a four-class pass for $88 (your first class is free), or in 1-month ($239), 3-month ($617-$645), 6-month ($1100-$1200) or 1-year ($1999-$2100) packages.